Moussaka is one of our all-time favorite Greek dishes but it’s fairly labor intensive. The actual assembly doesn’t take long but the preparation of the individual components may take a bit of time. It’s best to start early and plan each stage. It’s a nice dish to serve when company is coming over because the final stages are relatively easy. 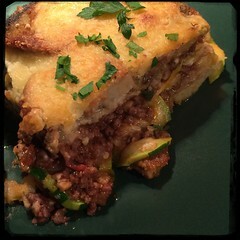 Ideas for celebrating or a good excuse to make Moussaka! Greek Independence Day – March 25th marks the beginning of the Greek War of Independence (from the Ottoman Empire in 1821). Tradition would have you eat fried bakaliaro (cod) and skordalia (garlic sauce) but we think Moussaka would be perfect. Since Moussaka is a fairly dense food combining meat and starch we find the best compliment are fresh or steamed vegetables with light seasonings. Rice may also be served. Here are a few examples. 4 eggs – whites, lightly beaten (reserve yolks for the bechamel). 1. Peel the potatoes and boil them whole, do not over-cook, you will need to slice them without letting them crumble! 2. Drain, let cool and slice them in 1/4 inch slices, set aside. 5. add salt, pepper, cinnamon and allspice. 6. Toss in some chopped flat leaf parsley and set aside. 1. In a saucepan, melt the butter over low heat. Using a whisk, add the flour while whisking continuously until smooth. Do not let it to brown! 2. Add the warm milk slowly, whisking constantly. 3. Simmer over low heat until the sauce thickens but doesn’t boil. 4. Remove from heat, stir in beaten egg yolks with a pinch of nutmeg. 5. Return to heat, stir until sauce thickens and set aside. 2. Lightly oil a large baking pan (lasagna pan). 3. Sprinkle some breadcrumbs on the bottom of pan. 13. Cook in oven for about 45 minutes or until béchamel sauce is browned. 14. Cool for 15 to 20 minutes before serving. 15. Garnish with chopped flat-leaf parsley on top.